Microsoft has added more control for administrators over what options are available to user via the Office 365 Portal. Using the ‘classic’ Office 365 admin center interface you navigate open Service Settings from the menu on the left and then select User software from that list that appears below. On the right you should then see all the options shown above. Via the ‘new’ Office 365 Admin center select Settings (the COG) and then Services & add-ins from the menu that appears. This should take you to the above page. Scroll down through the list until you see Software download settings and select this (the items are arrange alphabetically). This will open a new blade with the same settings as those in the ‘classic’ portal. You’ll see that you can select which Office PC software users can install from the web portal. You can also select which Office Mac software users can install from the web portal. I would expect to see more options start appearing for administrators via the web portal, so make sure you check back regularly. These days a new phone costs almost as much as PC, so it is important to firstly protect it and secondly to ensure you get full usage from it. The guys over at Mobilezap have provided me the Ultimate Accessory Pack for my new Lumia 950XL phone to review that should make ownership a whole lot better. The first thing that I applied was the screen protector, of which you get two. Basically, these are a thin shields of plastic that sit on the screen to protect it from abrasions. It was easy to install and I must say that you can hardly even notice it once it is applied. After protecting the screen, I put the phone in the clear FlexiShield case. It fits snuggly and doesn’t obscure any of the buttons. Hopefully now with protection on the front and back of the phone it’ll survive the normal bumps and scrapes most phones are subjected to in daily life. Next, I set up the desk holder so the phone can rest comfortably in view on my desktop. The angle is easy to see, although it would have been nice to have one that was adjustable. The car holder is really robust. Others that I have had over time felt really flimsy when taking the phone in and out of the mounting and tended to break after only a short time. This holder seems to be of a higher quality and ready for the hard work of being open and closed every time you mount your phone in the car. The USB power converter for the car is also great, supporting two USB connections that are plainly marked, which is really helpful in the confines of your car. Another handy item in the pack is the addition charging cable which means I don’t have to keep ripping the one off my desk that came with the phone. I also like that the kit contains a microfiber cleaner to remove all those grotty finger marks I put on the phone. There ain’t nothing like a clean screen. The only item I’m not quite sure I’ll be using regularly is the all in one stylus. However, it certainly works better than my fat fingers when it comes to stabbing commands into the phone. The redeeming feature of the stylus however is that it also doubles as a mini-stand, which is great for when I’m on the road. I think a kit like this is mandatory when you buy a new phone, especially for me who uses it all over the place. It is really cheap insurance for the protection of the phone also as an enabler of the device where ever you travel. 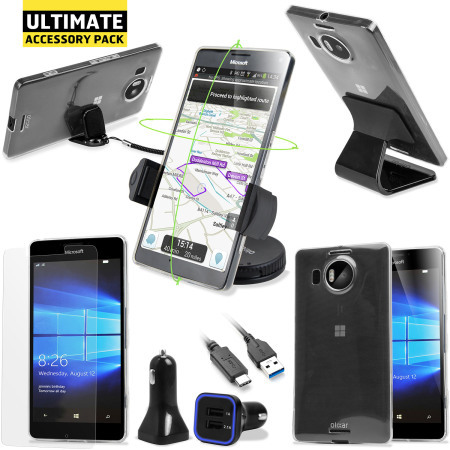 I’d certainly recommend this accessory pack to other Lumia 950XL users. Thanks again to Mobilezap for getting me the accessory pack to review. When you visit OneDrive for Business these days you get a ‘simplified’ interface like that shown above. What you may not appreciate is that you can map a network drive to your OneDrive for Business. Doing so makes it easier for people who are familiar with using only drive letters as well as for bulk uploads. Here’s how to do that. You’ll firstly need to temporarily revert back to the original, or ‘classic’, OneDrive for Business interface. You’ll find an option for that in the lower left of the screen. Once you’ve selected that you should be a more ‘SharePoint-like” OneDrive for Business interface as shown above. Don’t worry, the next time you visit your OneDrive for Business site it will have reverted back to the new ‘simplified’ interface. The ‘classic’ interface is only valid for the current browsing session. Even the interface here is somewhat simplified, so to display the Ribbon Menu you’ll need to select the COG in the top right of the screen to reveal a menu as shown above. From this menu select the first option Ribbon. Doing so will enable the standard SharePoint Ribbon Menu at the top of the page. Now you should see the additional tabs Browse, Files and Library displayed just above the search box as shown above. Select Library to reveal the Ribbon Menu. In the section Connect & Export, select the icon Open with Explorer. You may be prompted with some security messages like the above. If so, select Allow to permit the connection. In a moment or two you should see Windows Explorer open with the files from OneDrive listed as shown above. If you take a look down in the network area of Windows Explorer you will see the above mapping matching your office 365 tenant details. You can now map a drive letter to OneDrive for Business. To do this right mouse click on Network and select Map network drive from the menu that appears. Then press the Finish button. You will then see the mapped drive and if you select you’ll see the files within from your OneDrive for Business as shown above. As I have said before, the trend is away from static drive letters to plain storage to full collaboration environments. Yes, drive letters may be convenient for those who don;t want to change but I’d suggest they need to phased out because they are so limiting. But that is a topic for another blog post! Based on the success of this event it will be held in other locations. If you are in Sydney and interested in the topic then I hope you’ll support this event by registering and ATTENDING. Doing so will not only provide you with lots of practical information it will allow you to speak with Microsoft reps directly and let them know what type of training you’d like to see in the future (i.e. hands on labs). It will also help the local Microsoft people prove the ROI of the event so they can obtain the funding to run it elsewhere. The business model that many small technology providers followed was simple. Buy stuff, add margin, sell stuff. Then when stuff broke, charge a fee to fix stuff. That model had inherent flaws. Over time, the stuff tended to not break as much because it became more reliable. Also, the competition to sell stuff heated up and this drove the stuff to being a commodity. This meant that only those who sold the stuff (as it is effective all the same stuff) at the cheapest price got the sale. The cheaper they went, the more they had to sell. Soon the smaller IT business was muscled out of the selling stuff game by large box retailers who only survived by selling massive amounts of stuff. So now with the nice fat margins on stuff gone and stuff becoming more reliable what was the opportunity that small technology business opted for? They diversified and started selling different stuff. Firstly it is was PC stuff, then it was server stuff, next it was phone system stuff and so on. The belief was that the way to sustainable profitability was by going wider and wider with offerings. Going wider, unsurprisingly, stretches the business. Now they need to know more about all the stuff they sell. At some point this wide knowledge cannibalises existing knowledge. As the offering gets wider, the knowledge and experience across the range of product decreases and weakens. This decreases results in longer implementations, vulnerability to more skilled providers and generally makes the business operate in a far more frantic mode. In short, it’s a losing game. If going wider is a losing game what’s a winning strategy? As with most ways to be successful, it is the completely opposite to what you’ll hear from most people. In this case, it is about going deeper. It means niching down. It means focusing on what you do well and doing it even better. Now the defenders of the old ‘go wide’ model will point out that going deep means far less revenue. Of course it does, because you are selling less. Revenue is irrelevant, business is about PROFIT i.e. what’s left over AFTER you subtract, cost of goods and expenses and taxes. A focus on revenue is purely ego and plenty of businesses with lots of revenue have gone out of business because they generated little profit. Going wide is also a lazy strategy to pursue. That’s because it adds no value, it simply adds expense. There will always be someone else out there who is willing to charge less margin to get the sale. Thus, it becomes a race to the bottom and long before that point it becomes unsustainable for the small reseller. Going deep means adding value. It means adding unique value that others can’t add. Of course, you can’t typically take ‘value’ off the shelf, slap it on a product and sell it. You need to invest and develop value. This is what going deep is all about, investing your energies knowing your niche inside out and top to bottom. In the technology game this means you are going to have to dedicate constant resources to staying up to date due to the rate of change. It isn’t an option when you go deep, it is mandatory. The way that you mitigate the risk of going deep rather than wide is to partner with other going deep on their own complementary niches. Let me give you an example. I don’t do high end CRM. I know there is huge potential there and I could easily make lots of revenue there but I know I don’t have the resources to go deep on the product, so I don’t. What I do is partner with others who have chosen to go deep on CRM. I refer them CRM leads and they refer me productivity leads. We have an agreement so that everyone profits, including the customer who gets a specialist in CRM rather than someone who ‘kinda’ knows the product. Like the knowledge of going deep with your niche, finding, building and maintaining relationships with other product specialists takes time and energy as well as being something that always needs investment, but doing so allows you to focus and avoid spreading yourself too thin. In a competitive market, it is those who know their niche better than anyone else that win. The traditional IT reseller model of going wide is dead for only but the largest providers who have volume on their side. This only leaves the option of going deep on a niche as the only strategy that stands any chance of success. Continuing along the old path or failing to make the change is a recipe for termination of the business sooner or later. We live in a world with information at our finger tips but ask yourself how many people do you know who really have deep knowledge of something? Few have in my experience. Why? Because most allow themselves to be distracted by things that are not adding value. The sheer quality of choice has deceived them into thinking that they might miss something if they go deep and focus. However, nothing could be further from the truth. Just because you have more choice doesn’t mean it gives you more opportunity. Success is defined as the ability to focus on the options that provide the greatest return rather than the greatest distraction. Simplification is key. Pick the best choice you have and focus on that. Niche down. Niche further. And again. Then finally niche until it hurts. That where you need to be. Now that your world is small become the true master of that domain. Go deep and become the go to person for that to the point whenever they think of that niche they should automatically think of your business. Being a generalist means you’ll be the first one forgotten. However, being a specialist means that you’ll always get the call. Focus. Go deep. Cultivate relationships with others doing the same. If you do, your chances are much greater than the majority who will one day wonder how the world became so different and why they can’t pull up from the nose dive their technology business is in. However, don’t forget that its going to take hard work to make the change and continue success, but wouldn’t you prefer to put the effort into something that has a chance of success rather than being doomed to failure? The choice is yours. Over to you. Holy flying sharks Batman, the Need to Know Podcast has reached 100 regular episodes! Who would have ever thought back in 2010 when I kicked the podcast off, that I’d still be putting it out? Although the episodes haven’t been as regular as I would have liked over the years I thank everyone who has taken the time to listen and especially those people who have been guests. My guests have given both their time and knowledge to listens which I really appreciate. So now it is onwards and upwards to the next 100 episodes. If you haven’t already, I’d really appreciate you leaving a review on iTunes or just dropping me a line (director@ciaops.com) and letting me know what you think and importantly if there is anything I can do to improve the podcast. Once again, thanks to everyone who has supported the podcast over its first 100 episodes and I’ll work hard to make sure the next 100 are even better. As a follow on from our last episode on Azure storage, Marc and I now focus on the different storage options in Office 365 and how to take advantage of each. We consider best practices for data migrations as well as what experience has taught us when moving information to Office 365. Here’s how to set up a connector for Twitter. From the app launcher navigate to Outlook. From the options on the left locate the Groups heading. Under that locate the Create option as shown above to create a new group and select. You can add a connector to an existing group but in the list case I’m going to create a new dedicated group. This allows people to work with this specific information rather than mixing it in with other stuff. However, if you perhaps already have a marketing group, it makes sense to connect these to your favourite external service. The Office 365 Group creation option now appears on the right. Give the new group an appropriate name (here ‘Twitter’), set the Privacy and finally whether messages from the Group will be sent to members inboxes. Beware of using this option if you expect a lot of information to flow from the external source. When complete, select Create to continue. Next, add the desired members to this group by typing their name. When complete, select Add to continue. The new group will now be displayed on the screen. Across the menu at the top of the group select Connectors. This will open a new Connectors window as shown above. Scroll down the list until you locate the connector you wish to add. In this case, the Twitter connector is located. Select the Add button. You’ll now be prompted to login to the external service. Select Sign In to continue. Enter the details for the service and select Sign In to continue. This authorisation page may vary slightly depending on which external services you are connecting to. The next configurations will vary depending on the external service you connect to. For Twitter, you can select Twitter accounts to follow (@office365) as well as hastags to follow (here #office365). You then set the Notification options as well as the Frequency. You’ll then be returned to the Connectors page where you should see the connectors you just added at the top of the page. If you select the My Accounts option at the top of the page you will see all the external connectors you have configured as shown above. You can now close this window and return to the Office 365 Group. You should now start to see the configured external information start to flow into the conversations for that group as shown above. So, Office 365 Connectors are a way of bringing in information from external applications into an Office 365 Group. Once there, they can be shared with members of the group as well as being used a source of information to drive conversations. All of this information will also be available on Office 365 mobile apps. Microsoft’s blog post also mentions that a similar ability to this will soon be brought directly to users inboxes and then to other Office 365 services. Now combine these new Office 365 Connectors with Delve and you’ll see how rich an information source Office 365 will be, especially as Delve provides a single pane of glass across everything in Office 365, now including these external sources brought in via Office 365 connectors. Office 365 Connectors is currently only available for those configured for First Release but will soon be standard across all tenants. More connectors to other external sources will also become available. So go forth and connect I say! Introduction to Sharepoint Online and Managed Services. Creating your own repeatable IP is key to maximising profit for every MSP. SharePoint Online within the Office 365 tool box is the perfect platform to start building that. It also serves as great way to introduce your clients to world of possibilities you can help them achieve around automating many of their day to day tasks. Be it a simple holiday calendar, receipt tracker or even just taking advantage of implementing many of the prebuilt apps, building a templated set of tools you can apply to all your clients allows for high margin implementation and support – plus leading the way to even more the further you get into your client’s business. Maximize your profits with ConnectWise® CloudConsole™ by reducing time spent managing Office 365 user accounts and time savings from automating the billing process, saving you time counting users and updating agreements. Increase control by proactively monitoring Office 365 services so anytime there is a disruption or outage, you can be alerted to inform your clients. Join us for the Cloud Elevate Bootcamp to understand how you can enable your customers to automate their business processes using Office 365 SharePoint with Robert Crane, Microsoft MVP. Plus , Jeff Tessier from Connectwise to understand how it can help you automate your Office 365 business. Introduction to SharePoint Online & OneDrive for Business: Learn how to create and sell a SharePoint Online Intranet, create a site, deploying the site using a template and creating a sales/marketing process around that. This session will help you put in place the building blocks for introducing your clients to Office 365 SharePoint with basic document libraries and workflows and prebuilt apps. Introduction to Connectwise Cloud Console: ConnectWise® CloudConsole™ is a management, monitoring, and billing tool for Microsoft® Office 365™, built to save you time and reduce the complexity of supporting your clients’ Office 365 licenses.